Note that explanatory captions on this video are visible only if you watch on a computer and not on a mobile device. It was -7 C ( 19 F ) this morning, warming up to a maximum of -4 C ( 24 F ) by this evening when it started going back down again ( it's -8 C or 17 F as I type this). It's now cold enough that the lakes are frozen over such that they can be walked and skated on. I took this video on a ride right through Peelo, a 1970s / 1980s residential area of Assen, today. It's the same area as where I rode through the woonerven a few days back. The same area as where hopscotch is permanently built into the road. In the video we ride from point A to point B on the map, a distance of about 1.5 km or 1 mile through this suburb. Our route is along the cycle path shown by the wider red line which provides the main West-East route for cyclists, and of course also links with other routes to other destinations at either end. The narrower red lines show some of the other larger cycle paths in the area which make up part of the grid of routes required. Shops, schools and other services are all conveniently placed right on the main cycle path through the area. This cycle path provides the most direct route from West to East. It is not possible to make such a convenient journey by car because the roads take less direct routes with a lot of bends. It is to the advantage of cyclists that driving routes are unravelled from cycling routes. 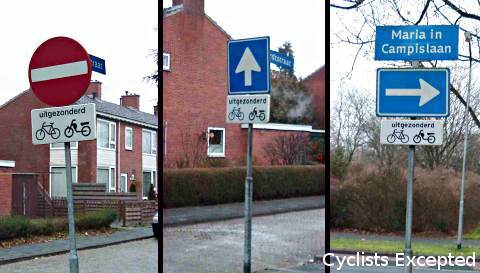 The photo shows how a road ends in a cycle path in front of these houses (the sign reads "fietspad" - Dutch for "cycle path"). It is a straight line along this path to one of the schools shown in the video. To drive there would require a considerable detour along many small roads. It is virtually always possible to make shorter journeys by bike than by car in this area, and this is why most journeys in the Netherlands take less time by bike than by car. For another view of this area, showing how convenient it is to get from homes onto this cycle path, see the video on a previous post. This area of Assen, as well as newer and older residential areas, features on our study tours for planners, campaigners and others interested in the role that infrastructure takes in encouraging cycling. Cycle path clear of ice despite temperatures below zero. Other cyclists left an impression on my camera only as streaks of light from their headlights. The old barracks building from the other side of the canal. Some of many bikes parked outside a bar in the town. House boats on a frozen canal. Quite a few people responded to a previous post showing a hopscotch game chalked onto the street outside our home. However, children playing on the street doesn't only happen completely informally here. This example is a hopscotch game which is built into a road surface, using coloured bricks. It is one of several in the same area. This area, Peelo in Assen, extensively uses the idea of the woonerf or "home zone". The speed limit on these streets is walking pace, and cyclists and pedestrians have priority over motor vehicles. The woonerven are connected together by roads which have a speed limit of 30 km/h (18 mph) as well as by cycle paths which give the most direct and convenient routes. This idea was very common in the Netherlands in the late 1970s through to the 1980s when this area of the city were built. Similar thinking can be seen in developments from the early 1970s and in later developments. Explanatory captions on this video are visible only if you view it on a computer and not on a mobile device. While this estate is now nearly 30 years old, many of the features of it are still not apparent in areas of housing being built in other countries. This area of Assen, as well as newer and older residential areas, features on the Study Tour. What are streets for ? This is what the street right outside our home looks like this evening. The local children have been playing hopscotch. Anyone on the way in or out by bike or in a car has to take care around the children. No parental supervision is needed. Sometimes the chalk paths and buildings made by the local children stretch all the way down our street and around the corner into the next. Children ride back and forth on a variety of different devices, or run up and down. Ball games are also encouraged by a goal on the green outside our home. No injuries, damage to property or car crashes have been reported as a result. Our home is in the middle of the google maps image. You'll see how these houses are built around a small green with a little playing equipment. The message is quite clear. The street is not merely a space for cars, it's a space for children to play. For people to socialise. On New Year's Eve, one of the neighbours put up a tent so all could get together and socialise in this space. This is a quite typical example of planning of a residential area in the Netherlands in the early 1970s (our home was built in 1972). The same principles are still applied, with the same results. A later blog post shows an example of a hopscotch game built permanently into a road in a residential area. A Cul-De-Sac ? Isn't that "bad" ? 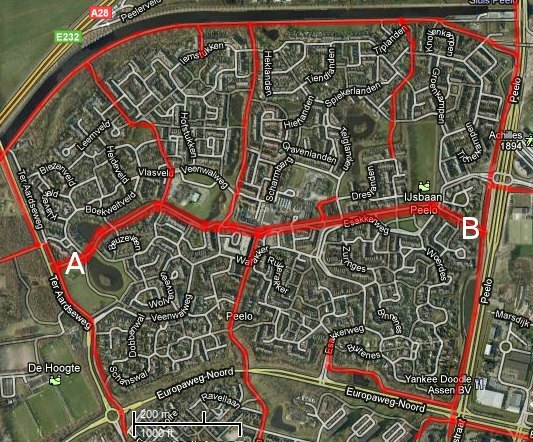 Like everywhere else in Assen, and indeed across the nation, whether cul-de-sac like this or another street design, all residential streets are connected to the finely spaced grid of very high quality cycle-routes which cover the Netherlands. 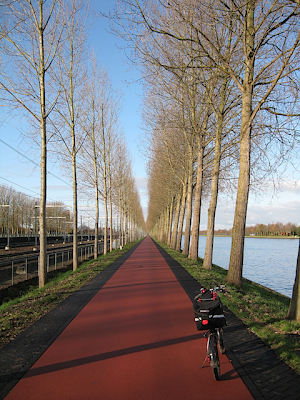 There are two high quality cycle-paths, both four metres wide, within 200 m of our home. These take us to every destination. There is no single design of residential street which discourages cycling and walking, it's the lack of a decent network of cycling facilities and the lack of subjective safety on the roads which do exist that cause the problem. Both areas feature on the Study Tours that we organise in Assen. Assen has quite a few one way streets. These are used to stop roads from being through routes for cars, and work to prevent rat-running in residential streets and keep the centre of the city empty of motor vehicles. However, there isn't a single one which doesn't allow cyclists to travel in the opposite direction. They all appear in areas where there is relatively little traffic and the speed limit is always 30 km/h ( 18 mph ). Signage to allow this is as simple as an "Uitgezonderd Fietsers" ("Except Cyclists" - sometimes using a picture of a bike) beneath the one way or no entry sign. It works very well, and allows cyclists to make those shorter and more convenient journeys which have to be possible in order that cycling has an advantage over driving. Back in Cambridge where we used to live, a debate still rages about allowing cycling in the opposite direction on one-way streets. It really is time that the UK in general got to grips with the benefits of cycling and started to encourage it. However, note that what does not happen here is relaxation of one-way restrictions on busy streets. These one-way restrictions are used to make the roads un-useful for through traffic and relatively empty of motor vehicles while allowing cyclists still to make direct journeys using the entire road network. There are many examples of infrastructure which make journeys shorter and more convenient by bicycle. The pictures shown were all taken within 300 metres of each other, but there are many examples in other parts of the city. To see the way this city makes cycling a preferred means of travel for most people, consider coming on one of our Study Tours in 2009. If you are interested in a cycling holiday to coincide with the Vuelta, please get in touch. Act soon as places will book very quickly. BEILEN - By order of ProRail, more covered cycle places have been built at the train station in Beilen. The parking now has room for 624 bike (previously 288). At the same time 64 bike lockers were placed as well as a space for 12 motor-scooters." Sometimes little stories like this, buried on page 45 of our 56 page weekly free local paper, tell a big story. Beilen is a small town 20 km or so south of Assen with a population of under 10000 people. However, cycle parking at the station is being taken very seriously indeed. Customers of First Great Western and First Great Western Link together make almost 60 million journeys a year with many travelling to or from the station by foot, on bikes, by bus, taxi or even by ferry. The new parking takes the total number of bicycle spaces at Reading to 160, with 302 at Bristol Temple Meads, 38 at Plymouth, 20 at Southall, 16 at Thatcham (including 4 cycle lockers), 100 at Maidenhead, 4 at Charlbury, 8 at Mortimer (including 4 lockers), 534 (including 10 lockers) at Oxford and 6 at Bramley. A big and impressive looking press release. But hang on... Just 200 new spaces spread between ten stations ? A total of 302 at Bristol ? That's less than half the total at Beilen, and Bristol has over 400000 residents. More than 40 times the population are fighting over less than half the amount of cycle parking at the railway station. Can it be right that availability of residents of Britain's "Cycling City" have 1/80th of the availability of cycle parking that is normal for a small Dutch village ? Beilen is a typical Dutch town and has enough parking spaces for 1 in 15 of the population to leave their bikes at the station. Bristol, on the other hand, is the newly crowned "Cycling City" of the UK and has enough for 1 in 1350 people to do the same. Is that enough ? Is it enough to justify such a press release ? Of these cities, Oxford, with it's 151000 population and 534 spaces is doing the best. They've enough spaces for one in every 282 residents. However, Oxford is historically one of the places with the most cycling in the UK. Even there the expectation is that cycling to the station will be over an order of magnitude less popular than in a small Dutch town. It's not just the railway station of course. When I cycled through Beilen a few weeks ago I took a photo of bikes parked at a bus stop as well as a bit of video which you can see here. It's sometimes difficult to explain to people from the UK or USA just how much cycling there is here, both in the cities and in small towns. Cycling is incredibly popular in this country. It's not just an incremental difference, but a staggering one. What's more, cyclists are very well looked after, and not only at railway stations. Come and see it for yourself. Judy went to Beilen and took some photos of the new cycle parking. You can see the new tulip style bike racks under cover in the photo to the right. There are also secure lockers, for which there is a fee. You can tell this is all very new because the sand still hasn't settled between the tiled surface. Groningen's main railway station has nearly 10000 spaces and is added 500 cycle-parking spaces every year until 2015. Groningen has less than half the population of Bristol. This might be a good time to mention again that 40% of all train passengers in the Netherlands arrive at the station by bike, and that because they only use a bike for part of their journey none of them count towards the cycling statistics. Also see the other posts about integrated transport. Through velorution I've learnt that Boris Johnson is behind a sharp reduction in cycling funding in London. It's another of those stories which actually creates a fog rather than making anything clear. There are various large figures being bandied about, but the LCN+ network funding has been cut in half. What is Boris thinking of ? Not long ago I pointed out that Boris' transport advisor announced that there "should be no hierarchy of transport users but instead everyone should have the opportunity to use the roads. ", when it comes to encouraging cycling. It sounds very democratic, but decisions that people make on how to travel are based on the infrastructure around them. When the infrastructure which exists has been primarily made to suit driving, as is the case across the UK including London, it should be no surprise that driving is the most popular way of getting about. It's just no good to pretend to be "modally agnostic" while supporting a continuation of current policies which favour motoring. A diversion of £10M from the cycling budget this year to improve traffic lights simply serves to continue to make driving more popular than cycling. For all the bluster about it, and claims that vast amounts are being spent, funding of cycling in London is really not very high. The recent decision halves the funding for cycling infrastructure to just £10M for this year. There are 8M people in greater london, so that is about £1.25 per person. About €1.50. Is this really enough to transform London into a "true cycling city." ? London currently has around 500000 cycle journeys per day, which might sound like quite a lot. However, around 8 million people live in the city. Given that the average number of journeys per person per day is a little over 2 in most places, this suggests that around 3% of journeys are by bike in the city. Assen is a very small city by comparison, with just 65000 people. However, they make between 70000 and 80000 cycle journeys per day. Between 35% and 40% of all journeys are by bicycle. Assen takes cycling seriously and builds good quality infrastructure for cyclists. The cycling infrastructure budget is around €27 per person per year, or £23, and that's for a place which benefits from 30 years of investment. London: Anyone heard of social safety ? The photos on this blog post were taken in London two years ago on a ride from Cambridge to the Thames and back. We found these paths were quite popular, but as they don't provide an efficient way of going anywhere in particular and they are not really very high quality, they can only have a very limited effect on modal share. If you want to make journeys in directions other than along the Lee valley you will in most cases be riding on busy roads. This is why London's cycling rate remains low. The level of subjective safety on routes suitable for making real journeys is too low, and the practicality of routes like this one is also far too limited. Cycle routes need to be both direct and safe. People shouldn't have to choose between safe or direct and it certainly should not be as in London, where the "safe" routes are not really safe and the "direct" routes are not as direct as they could be. Sadly, the design of transport infrastructure across the English speaking world emphasises driving above other modes. This is why English speaking countries share some of the lowest modal share for bicycles at around 1% of journeys. It had been a while since I looked at this post but the article on the Guardian website which it links to makes a little more sense now. The announcement of the "largest ever" £168m funding package was of course referring in the main to money made available for the "Boris Bikes" bike sharing scheme. This has gobbled up a huge amount of money but of course has failed to make London into a "true cycling city" because as I wrote two years after this post, "a shortage of bikes was never the reason for the low cycling rate of London". The problem all along was the poor infrastructure and five years after this blog post, London has again been fobbed off with inadequate plans by Boris. The 2013 plan still does not offer enough. It again does not have enough money allocated for it, again much of what is allocated is destined to be consumed by the hire bike scheme, and the target set is for just 5% of journeys to be by bike. In June 2006 my friend Terry and I cycled from Cambridge where we then lived to the North bank of the Thames in London and back again. It was a practice ride for our Land's End - John o'Groats tour a month later. The photos all come from that ride, and show various aspects of infrastructure which really needs some money spent on it on what is mostly a Sustrans route in London. In order they show a 5' (1.5 m) headroom sign on a cycle route, a dead end, a barrier around which it was impossible to take a bicycle without lifting it and which follows on to a path which is difficult to cycle on, is narrow and shared with pedestrians, a corrugated surface by a canal which provides excellent traction for horses but is painful on a bike and another lack of headroom with a barrier. The alternative route was composed of busy roads. It's pretty obvious that there is a lack of quality here. Sustrans are not helping the UK by rubber-stamping junk. The temperature today has varied between -1 C and 0 C. Just below, or at, freezing point. And it's been foggy for the entire day too. Not great visibility, and rather chilly conditions for cycling. However, the cycle paths have no ice and us cyclists are over here on the cycle path instead of mixed in with the cars over there. The result is that there are as many cyclists as on any other day. i.e. lots of them. This includes those three children riding along beside each other in this photo (one holding her friend's handlebars as they go along together) as well as the adults following behind. In circumstances like this, the enhanced subjective safety of a separate cyclepath makes a huge difference to whether adults will cycle - or let their children cycle without supervision. There are other posts about cycling in winter. Come and see the conditions in this country. Take a holiday or a Study Tour. If you want to experience it in winter, come on our Winter Warmer weekend. Parallel kerbs can be quite dangerous for cyclists. A slight lapse of concentration and you can be off your bike, and possibly injured badly enough to end up in hospital. Like so many things, this doesn't have to be the case. The kerb shown here is one of many "forgiving" angled kerbs in use in Assen. These kerbs make it possible to cross from the cycle path to the pedestrian path without falling from your bike. They reduce the risk of injury due to a lapse of concentration. Note that the rise is very small. Only a few cm. When taller angled kerbs are constructed, these do not enable safely mounting the pavement. Also note that the angle is important. If the kerbs are much steeper than 30 degrees then it becomes difficult to ride up the kerb without the tyres sliding sideways. This of course becomes a greater problem when there is rain or ice. The video demonstrates how you can ride up and down the kerb without losing control of your bike. Explanatory captions are visible only when this video is played on a computer and not on a mobile device. This kind of innovation makes the cycling environment very forgiving of errors, and keeps down the injury rate of cycling. It is one of the many very small details of the Dutch cycling environment which add up to it being very safe overall - the concept of making the road environment more forgiving of error is called sustainable safety. These kerbs make it possible to take a bicycle onto the pavement when there is a lack of space, such as here during a cycle racing event (the road is being used for the race, the cyclists on the cycle-path are going slowly). Note that on the road side of the cycle-path there is no forgiving kerb. It would not help cyclists on this side. In the city centre, cyclists can easily access cycle-parking facilities because of the kerb design. Finally, an example which doesn't work. This is too high and a little too steep. It's not possible to ride up this kerb. It's a good example of drain treatment, though. This is the same cycle-path as shown towards the end of the 2008 video. "Parallel" refers to the kerbs being parallel with the direction of travel. Even a very small gap can cause cyclists problems if it is parallel. Riding a bike in the winter is a bit different from the summer. OK, so it's colder. However, so long as you've got sensible clothes on you warm up pretty quickly. It's very pleasant. The air is fresh and the sun, when it shines, is wonderful. Shadows from the low sun in the winter look amazing. However, you do need the surface to be clear of ice, which it luckily is here. When I left home this morning it was -2 C ( 28 F ). By the time I was home I had done 78 km and it had warmed to +2 C ( 35 F ). This morning I took the Xtracycle out to take some customer's bike baskets to the post office and also collect a Christmas tree. One of my local bike shops turned out to be selling trees, so I went no further. As ever, my journey was direct and almost entirely free of cars. A lot of roads don't provide through routes for drivers, who are funnelled together on what are often less direct routes. The bicycle road along the canal is the most obvious example of this idea. It's wonderful to cycle along, leading directly from the centre of the city past the suburbs on the west where we live and right out to the new housing estate built on the very edge of the city. It is impossible to drive along this route for far, so the only cars you see are a few using it for access to homes. There is another short video of the same bicycle road. This isn't the first time our Christmas tree has been brought home by Xtracycle. "This is a "Auto te Gast" route, about 5 m wide. The dark strips on the side are "bricks" (made of the same meterial as the rest of the road), but they make a good noise in cars that have to drive on them. The photograph was taken near Maarssen railway station, looking north." "It is unfortunate that the connection to this cycling path in Utrecht is a bit awkward, but otherwise it is a great commute over this path. I know that a few Quest riders use this path to go from Utrecht to Amsterdam, perhaps not on a daily basis, but a few times a week at least: 50+ km one way." "Auto te gast" means that cars are guests on this road. 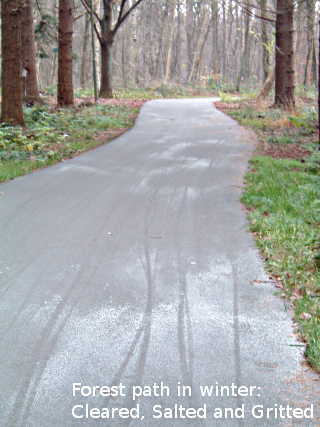 For more information, see posts about the bicycle road within Assen. Bicycles have priority over cars, which are rare because it's not a through route by car. This is an example of infrastructure which gives cyclists a better route than drivers. I should point out that this is hundreds of kilometres from Assen. Good quality infrastructure in the Netherlands is not just concentrated in a few small areas, but spread across the whole country. Most intercity bicycle highways do not allow cars at all but it was necessary to allow vehicles for access in this location. The Quest that he refers to is an extremely fast faired velomobile. It's been featured several times on my blog before. If you want to commute quickly in all weathers, a velomobile is the way to do it. I made a video of riding in this location with a group of velomobiles. Click for more posts which show examples of cycle facilities emphasizing the convenience and speed of cyclists. A glimpse of Utrecht itself, a different way of getting to work there, and the amazing number of bikes parked at the railway station is seen here. keeping cars out of the way. Read more. What does this have to do with cycling ? Well, these are precisely the sorts of statistics that many cyclists like to quote to non-cyclists to try to encourage them to cycle in countries where there is little cycling. Does this work ? Generally not. Cycling remains at around 1% of journeys made by bike in the English speaking countries. People who are enthusiastic cyclists cycle. Those who are not enthusiasts don't. In that way it's very much like skydiving. People use both activities to raise money for charity. I share with a lot of my readers that I wouldn't willingly jump out of an aeroplane with a parachute no matter how safe I was told it was. I can see that it's thrilling, and I'm sure it is fabulous fun. However, jumping from an aeroplane offers no utility to me, and it is way past my threshold for subjective safety. Many people feel the same way about cycling. So what is the difference between the Netherlands, where everyone cycles, and the countries where few people cycle ? A cycle ride here is always a pleasure. Motor vehicles are generally somewhere else. What's more, everyone does it. From children, through families together on to older people. It's a logical impossibility to expect 40% of journeys by bike if cycling only appeals to 5% of the population. That is why cycling here has to be for everyone and why a high degree of subjective safety is vital. A high cycling rate and high subjective safety cannot be separated. This is why I've highlighted subjective safety in a number of posts. If you live in a country where there is a low level of cycling, you live in one where the subjective safety for cyclists is too low for most people to consider cycling. Without improving conditions cycling will continue to look like an extreme sport to many people and you will have as much success in increasing the rate of cycling as in convincing the general public to skydive. While cycling in busy traffic might sometimes seem like an extreme sport in some countries, it doesn't here. The woman in the photo is definitely not engaging in an extreme sport. There is no "traffic jamming" here in Assen. The nearest any car travelling at speed will get to her today is if one crosses over the bridge she's just passed under. What's more, she is on the most direct route to the centre of the city. This high quality cycle route is closer to a straight line than any route by car, and has no traffic lights on it, vs. a minimum of three sets by car. Wonderful conditions for cycling like this attract people to cycling. To see conditions for cycling which are so irresistable that they attract everyone, come on a Study Tour. If you simply want to relax in conditions away from the stress of cycling elsewhere, consider one of our holidays. I should perhaps point out that I have no argument with skydivers. If you want to throw yourself out of a working aeroplane, that's fine by me. However, if you don't mind, I'll just watch. It's a cold day here today. The temperature is 0 C ( freezing point ) and snow is falling. I just went out for a quick ride around the block in the snow to show that cyclists don't stop here just because it's a bit cold. These two are primary school children returning to school after going home for lunch. Primary school children almost always go home for lunch. My youngest daughter and a friend returning home - they had a half day today, though not because of the snow. This is the same location shown in the rush hour video. I have no doubt this area would have been just as busy this morning despite the cold. A second cyclist in the same location. Note that despite the cold he's confident enough to use an umbrella to keep the snow out of his eyes while cycling. All the cycle paths and roads have been gritted and salted so there is no chance of slipping over. Someone without gloves so keeping his hands warm in his pockets instead. Cycling is important here. It is treated seriously. If a high rate of cycling all year around is important then it must be possible for cyclists to use their bikes in all conditions. I have a series of posts about winter riding and night riding. There is also a video from last year showing cyclists in the city centre at sub-zero temperatures. The first two photos were taken on cycle paths, the middle two on a junction between a bicycle road (where cyclists have priority) and a cycle path, and the last two photos were taken on roads. I should perhaps point out that due to the amount of salt that has been put on the road, the slush that the cyclists are riding through corrodes everything on a bike quickly. A quality Dutch bike for everyday use has a fully enclosed chain and a very good paint job. The blue sign says "rechtsaf voor fietsers vrij" or "free right turn for cyclists." This indicates that it is legal to make a right turn at this junction when the traffic light is red. This is a privilege that is only extended to cyclists. Drivers must always wait for a green light. You can do this at many junctions where there is a fully segregated cycle path, and there is usually no sign then. However, at junctions like this where all the traffic comes together some indication is needed to show whether a right turn is safe at this location. The video shows the way this works. You go from one cycle path around the corner onto another without stopping, and without having to worry about motorised traffic as none of it is in your lane. The keen eyed will have noticed that there is also a white and green sign underneath the traffic light. As well as allowing right turn on red, this is also a simultaneous green junction, go to that link for more information. Thousands of traffic light junctions across the Netherlands allow cyclists to make right turns on a red light, and this contributes to making cycle journeys faster than equivalent journeys by car. There are several other blog posts illustrating the details of what makes Groningerstraat in Assen a good place for cycling. Paris has achieved much press over the last few months for its implementation of right on red (and straight through on red) for cyclists. None of this is new. It's been normal across the Netherlands for over a decade now. Good lighting is an essential part of a cycle path which is to be used after dark. Without it, social safety problems creep in. People start to wonder what is hiding in the shadows. While Assen is a very safe place, it wouldn't do to give people any reason to be scared to cycle at night, or for them to be scared to let their children cycle at night. 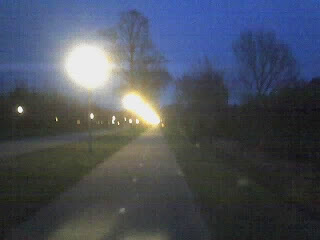 So, here we have a rural cycle path at night, showing the lights which keep subjective and social safety high. Note that there are no lights on the road at this point, but the cycle path is still properly lit. From Friday 9th to Monday 12th of January we are organising a weekend winter warmer cycle tour. Perhaps you've not used all your holiday days this year ? It's a chance to come for a short tour in and around Assen in January and see much of what this blog is about over a long weekend ? The photo at the top was taken on January 13th exactly one year before the weekend. The weather is likely to be quite similar. Either bring your own bike or take a hire bike. We can arrange that too. We'll not be riding extreme distances, perhaps no more than 60 km per day depending on the group and the weather, and with plenty of stops at warm cafes and restaurants between views of the countryside, which looks spectacular in the winter. This is a cycling holiday, of course, but we will also have a programme of activities within a very short cycling distance if the weather is really bad. This includes a short form of the Study Tour presentation, and some of the infrastructure presented on the Study Tour will also be shown off on this tour. Cyclists are looked after here. You can expect the cycle paths to remain passable whatever the weather, and for there to still be many cyclists using them in the winter. Full details are on the winter warmer webpage. All the photos were taken in the 2007/8 winter. There are many things to see in the winter, including the deer which live right in the city of Assen. Would you rather come over later in the year ? Take a look at our other cycle holiday plans later in the year. We will also be running a full Study Tour in May. Are transport priorities the right way up ?